Cue the confetti! (Or not, it’s messy!) It’s time for another Best Beauty Products of the Month wrap-up and I’m pretty excited about this one. I love it when I find products that truly deliver on their promises, don’t you? 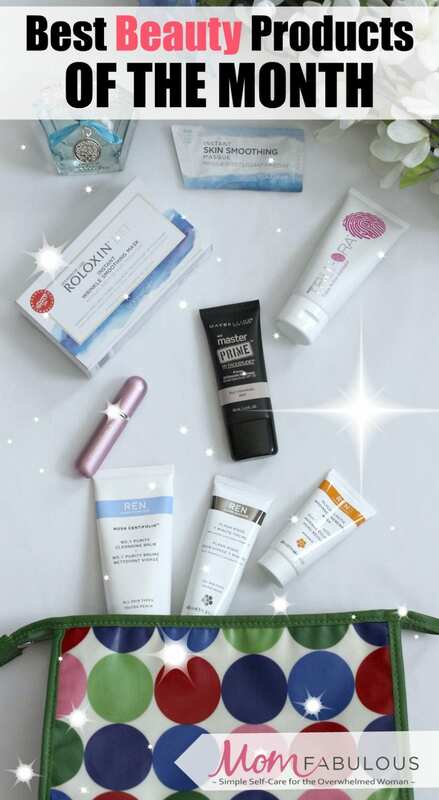 For edition #3, I’m including mostly products that help you achieve beautiful and healthy looking skin, plus my favorite beauty travel gadget. Roloxin Lift – This product was the winner of the Allure Beauty Breakthrough Award in 2014 and is the only instant skin-smoothing mask powdered by the company’s patented SilicaLift technology that lasts up to 24 hours. Within 7 minutes of application, you’ll notice wrinkles and fine lines diminishing as well as more radiant skin. I’ve used this four times over the past couple of weeks in the morning before putting my makeup on. All you do is take a packet and massage it (which activates it) for 20 seconds. Apply the entire packet evenly on your face and let it sit until it turns to a white powder; about 5 to 7 minutes. Wash it off with warm water (I use a wash cloth to get gently remove it around my eyes, nose and mouth) and then follow up with moisturizer and makeup. My makeup looks smoother after an application, which I love. You can purchase this at Sephora for $45 (5 applications). I plan on using this for special occasions or events I’m attending where I want to look my best. Trufora Triple Action Exfoliator – I have always had very dry skin and it wasn’t until I started exfoliating regularly, that I was able to remedy this problem. My foundation never went on smoothly and by the middle of the day my skin would feel so tight. I am so excited to introduce you to one of my new favorite exfoliators. Not only does it work incredibly well, but its headquarters are based in my hometown of Austin. I love that! And, all of the products are made in the U.S. If you’re dealing with aging skin like me, regular exfoliation is key to healthy skin. You’ll notice better texture, tone and a brightness to your skin. As our skin ages, it gets very dull and dry, causing your makeup to not look quite right. If you’ve used harsh exfoliants in the past that have left your skin feeling stripped – leaving a tightness, stinging or irritation feeling – you’re using the wrong exfoliator and your skin doesn’t like it! Trufora Triple Action Exfoliator is gentle and leaves skin glowing and hydrated. I use it twice a week and am hooked! 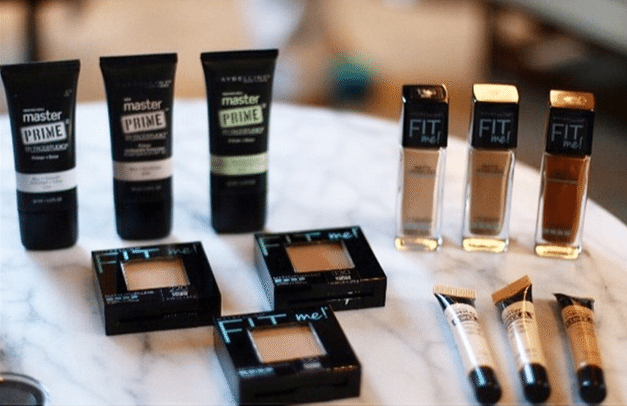 Maybelline New York Face Studio Master Prime Makeup – I’m not going to tell you how many primers I’ve tried because it’s, well, embarrassing – but I’m glad to tell you I’ve finally found one I really like. Better yet, it’s an affordable drugstore brand! Maybelline New York Face Studio Master Prime visually blurs skin tone and imperfections. You can wear it with or without makeup and it’s incredibly light feeling on the skin. I noticed a big difference when I wear foundation without primer and now ‘never leave home without it’. I’ve started using all Maybelline products for my face including the Primer, FIT me! foundation, concealer and powder. Travalo – That little pink tube pictured above is one of my all-time favorite travel companions ever. You see, I’m a fragrance girl. I love to wear perfume and rarely have days I don’t apply some. My daughter is the same way, so when we travel (and try to travel light) we’re always struggling with whether to bring our favorite perfumes or not. There’s the possibility of it shattering in our luggage and it’s too big of a liquid to bring in our carry-on. But ever since I was introduced to Travalo years ago, I never travel without it! In fact, I carry it around in my purse for everyday use. Travalo HD allows users continued ability to refill the inner bottle directly from a standard perfume bottle through the patented and unrivaled Genie-S pump-fill system. Thus, ensuring that their fragrance is never contaminated by exposure to the air and decants magically from one sealed bottle into the leak proof atomizer in a few seconds. It’s TSA approved, holds about 65 sprays of perfume and sells for $19.99. REN Skin Care Trio – I wrote an entire post about this lovely skin care trio, which you can read here. I still use it. I still love it. And you can still get all three for only $39 until April 21st! After that, the price goes back up. You can read all about the power of this trio here or go ahead and purchase one for yourself or a friend here. Are there any new beauty products you’ve recently tried and want to rave about? Let me know in the comments below! But before you do, enter my giveaway to win a box of Roloxin Lift. (You must be 18 years of age to enter and a resident of the U.S.) Four winners will each win one (1) box of Roloxin Lift. The giveaway ends on April 14, 2016 and winners will be selected on April 16, 2016. Hi Ellen! I was also struggling with acne and started using a Retinol cream. It cleared it right up! Just entered! My biggest problem is bags under my eyes! These products look fabulous! I so want to try that Roloxin Lift – sounds amazing! ahh…aging…its NO fun. I have noticed such a difference in my skin the passed 2 years…after hitting my mid thirties. I use enough products to moisturize a small army..at least it feels that way. these are ALL new to me…I am a huge fan of trying out new things..you just never know WHAT product will give you the best results!!! Thanks for sharing. Right now my biggest problem is acne, at 29 no less, and I’m noticing things like fine lines starting to show up. Wrinkles and fine lines. Thank you for the chance to win! Dryness – my skin is always dry no matter how much I moisturize.